UTMOST uses the interferometric synthesis imaging to obtain high spatial resolution images of the radio universe at 843 MHz. The telescope consists of 352 independent modules, lined East-West, along 1.6 km in two arms. 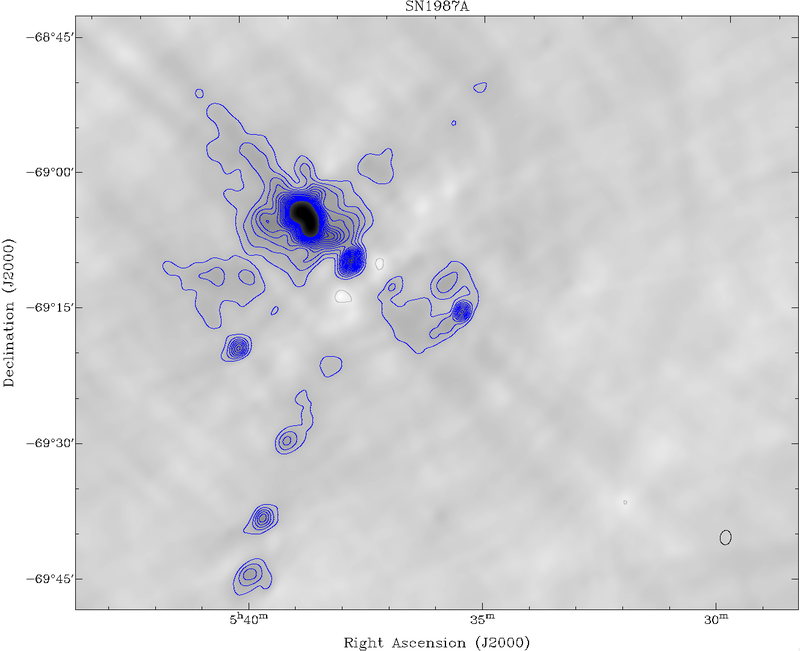 Twelve hour scans of the sky lead to images via our GPU based correlator, which is presently (early 2015) able to operate on 88 modules (1/4 of the telescope). The remaining GPU power to process all 352 module is slated for installation in mid-2015. We plan to implement a GPU-based FX-correlator to provide fringes for up to 61776 baselines. We can presently handle 3828 baselines with our GPU-based F-correlator in 22 Nvidia GPUs. In addition to searching for Fast Radio Bursts, the imaging mode may play a crucial role in localisation of FRBs using radio imaging of the FRB fields. Molonglo’s field of view is about 1 square degree in imaging mode. 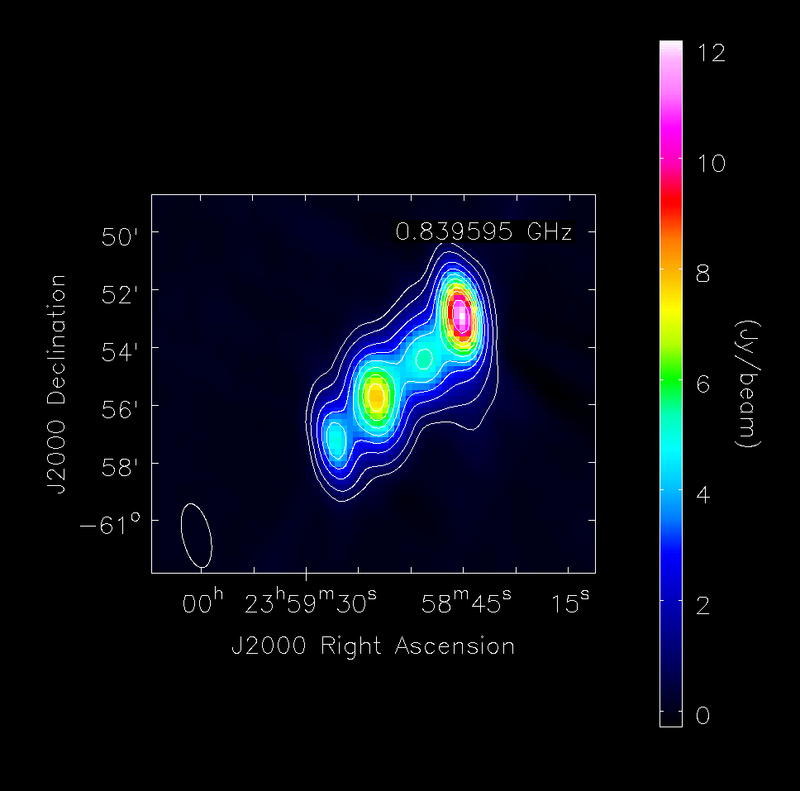 Monitoring of fields for radio transients is expected to begin in late-2015, as we sensitivities of a few mJy/beam. 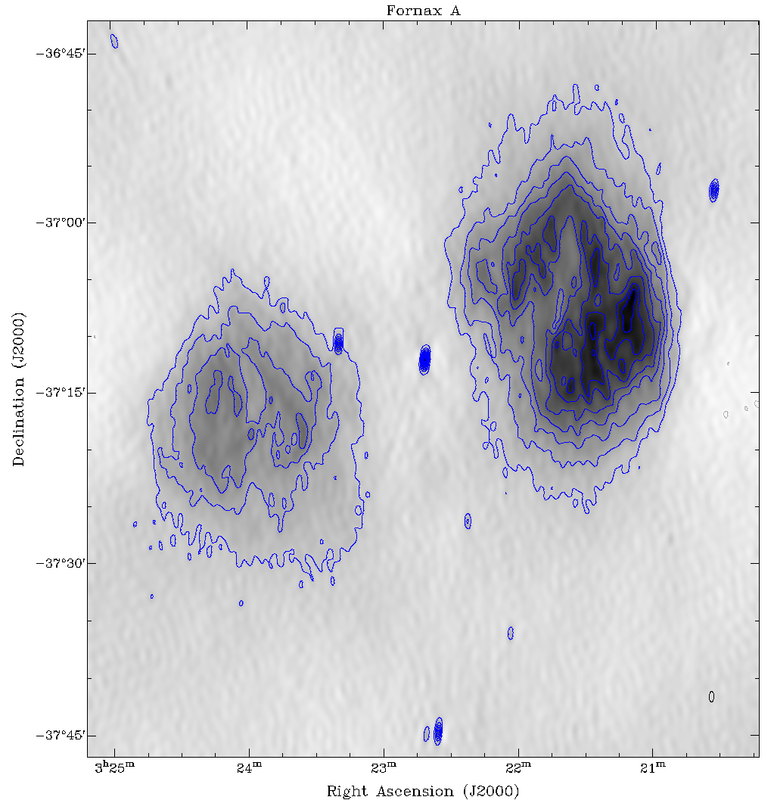 Examples of our first images are shown below, using 88 modules, or about 1/4 of the telescope surface area. Imaging began in late 2014. Our first image taken with UTMOST, a 6 hr track of a radio galaxy J2359-6054. The phase calibrator J2341-5816 was observed for for 10 minutes for every 1 hour track of the galaxy. Natural weighting and uvrange of (0.1,5) kilolambda was used. This is the clean map and the RMS is ~3 mJy/beam. Credit: Shivani Bhandari. An image of the supernova remnant of SN1987A in the LMC, made from 6 hours of data, split by ~40 hours. A calibrator was observed every hour. Image noise ~ 22 mJy, and contour levels are at -110, 110, 220, 330 … mJy. This very early image is one of the first made with the new GPU-based correlator system, and utilises only a fraction of the final system sensitivity. Our best image to date. Nine hours tracking the source, of which most was usable. We observed a nearby phase calibrator every two hours. The image noise ~ 5 mJy, and contour levels are at -25, 25, 50, 75 … mJy. This image produced on only 1/4 of the array (the remaining 3/4 to become accessible with the installation of the second half of our GPU correlator). Credit: Vikram Ravi, Chris Flynn, Matthew Bailes.